Natural England were so concerned that Island Roads had started work in a legally-protected SSSI area without permission, they’ve told them to stop. We’ve got the detail. The long-discussed plans to finally give some sort of access – even if it is just a footpath to start with – through Undercliff Drive, after its disastrous collapse in February 2014, has come to a grinding stop … just as soon as it started. Island Roads had to pull their contractors off site after it became clear that they hadn’t sought the correct and legally required permissions to carry out work in a SSSI area. Had they not stopped, the situation would have become “Very Serious,” Natural England (NE) told OnTheWight. NE – the official body that is charged with protecting England’s nature and landscapes – is sufficiently worried about the situation that they making an official visit to the site this week. SSSI land (Sites of Special Scientific Interest) is highly-protected, in law. Permission to carry out work must be sought in advance before it’s started. Following that, the minimum required is an ecological report, sometimes a ‘watch brief’ (an ecologist present while the work is be carried out). Draft plans for this scheme have been in circulation since August last year, although it’s understood the Isle of Wight Council has only recently instructed Island Roads to start. Last week a contractor was instructed to go into the SSSI site and cut down a number of trees, including one that was 120 foot tall. Matthew Taylor from Natural England told OnTheWight their general rules are that trees cannot be felled in an SSSI area at this time of year, as the trees “support wildlife” and often have nesting bird in them. Given this, it’s usually the end of August or September before felling can occur. The cutting of the trees was just the start of the planned actions. Island Roads had intended – before being stopped by Natural England – to remove all of the vegetation from the area and to cover the SSSI area in tarmac. Asking Matthew about this, he said this is “A big ‘No No'”, especially without consent. In the eyes of Natural England using the area would be seen as a “Net loss of SSSI” that would need its own survey and importantly “Mitigation” – that being a similar area of land would have to be found nearby that could be suitable as a SSSI area. Without this Natural England would view the SSSI area as lost. It’s believed the land where all of this work is being carried out is not owned by the council and that neither the council or Island Roads have gained permission from the owner to carry out the work. Without permission from the land owner, this could be viewed as criminal damage. OnTheWight has posed a number of questions to the Isle of Wight council and separate ones to Island Roads. What has been received in response doesn’t answer those questions. Pointing this out has led the council to refuse to answer those questions. More on this later. 29 Comments on "Island Roads carried out work in SSSI without seeking permission. 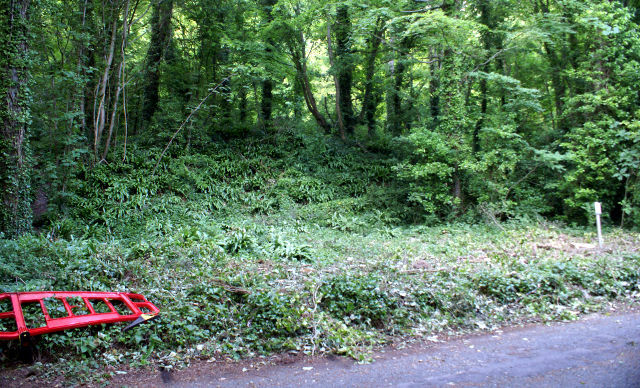 Natural England stop them"
It’s also important to know what vegetation and trees to cut down – or not – in areas like Undercliff, because the vegetation soaks up water that could prevent further landslips! Has IR carried out a survey of that? There is no conspiracy here, I am afraid. IR are not spending money….they are earning it! IR need to have consents in place… if they havn’t then they need to get them. Until the meeting with NE goes ahead later this week we won’t know what delay is involved. I am hoping it wont be extensive. On the basis that Island Roads seem to be singularly unable to identify the differences between backsides and elbows, what hope did they ever have of being able to understand the impacts of sending someone into a Site of Special Scientific Interest? Any permissions required for ANY scheme carried out by the service provider MUST be obtained by the service provider. That includes acquiring land if necessary. No it doesn’t help. The Council is ultimately responsible for all that has occurred here. It should be transparent and accountable and hold a proper enquiry into the failed scheme and its consequences. You cannot hide behind the PFI contract. The contract is very clear about how the responsibility falls upon the service provider to obtain ANY and ALL consents needed. No one is hiding behind any such thing. I am commenting on the current scheme not the previous scheme. It’s all one. An ill-conceived poorly designed scheme, recklessly implemented, with disastrous impacts on the residents, the beautiful landscape of The Undercliff and its protected habitats. No its not… the current scheme does not even restore a through road. Indeed, the encroachment outside of existing road onto adjoining land is fairly minimal. A small number of yards. There is no connection between the two schemes. Would you prefer the work was not undertaken at all….? Phil Jordan. I understand that Natural England will be investigating ALL the damage that has been done, including the abortive engineering scheme which was carried out without SSSI consent. The sustainable through route between Ventnor and Niton has been in constant use now for over 14 years – inland via Whitwell. This is the reality. Yes, residents need an access solution, but please get it right! …and laid potentially contaminated materials in the SSSI without consent…..? The inability to efficiently coordinate the excessive consumption of alcohol in a place where beer is brewed springs to my mind. I know they employ Gavin for PR, but does anyone actually MANAGE Island Roads? The IWC contract manager for the PFI contract is Bill Murphy. @Sciolist- IR is eventually “managed” (manipulated?) by the shareholders of its investment bank owners in Luxembourg and France. Maybe I won’t bother with that planning permission after all for my extension. I’ll draw up a contract for my architect and builders so that they are responsible for getting the necessary permission. It is after all only a small extension with minimnal incursion into an SSSI. Therefore the planning department couldn’t possibly hold me ultimately responsible? Watertight….I think not.